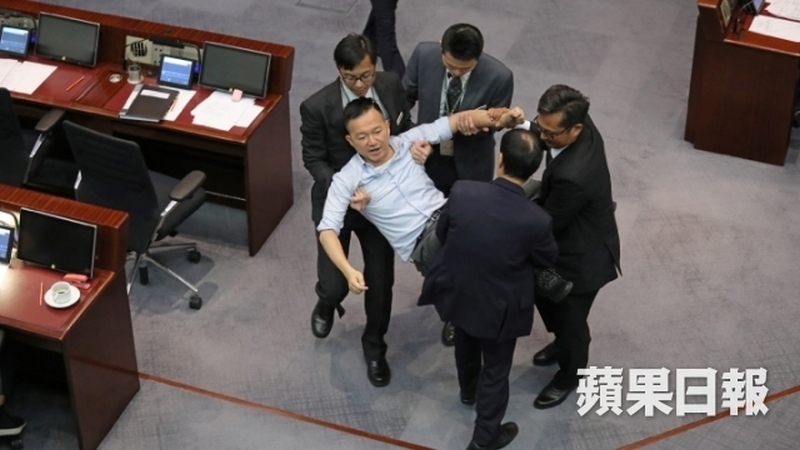 Four pro-democracy lawmakers were ejected from a legislative committee meeting on the Guangzhou-Shenzhen-Hong Kong Express Rail Link on Monday upon the orders of committee chair Regina Ip. Democrats Ray Chan, Au Nok-hin and Jeremy Tam were removed by security after Ip said they had misbehaved and shouted during proceedings. Ray Chan being carried away by guards. Photo: Apple Daily. They were protesting Ip’s limitations on speaking time, as they were given only one minute each to air their views on the joint checkpoint mechanism. Ip also decided that, in order to save time, officials would not have to answer all questions one by one – instead, they could provide a comprehensive answer to cover all questions. 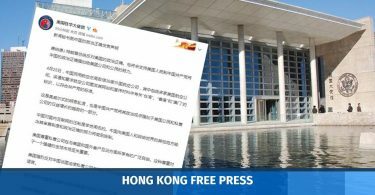 The pro-democracy camp and the Hong Kong Bar Association have cast doubt over the constitutionality of the checkpoint arrangement at the new Express Rail station. 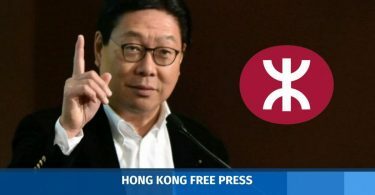 Hong Kong is set to effectively give up its jurisdiction across a quarter of the West Kowloon terminus, where immigration and customs procedures will be performed by mainland law enforcement agents. Critics say it amounts to a ceding of land to China, though Ip has set a deadline of Monday to complete legislative scrutiny. As security guards surrounded Chan, he put up his chair onto the table in an attempt to block them. But it was unsuccessful, as he and Au were carried away. Tam was escorted out. “Ip has no right to deny our right to review this bill as a representative of the people,” Au said. Au Nok-hin being carried away by guards. Photo: Apple Daily. After the meeting was resumed, Ip announced that she would skip the scrutiny process for the bill’s additional schedules – the last part of the bill – and would move on to reviewing its amendments. 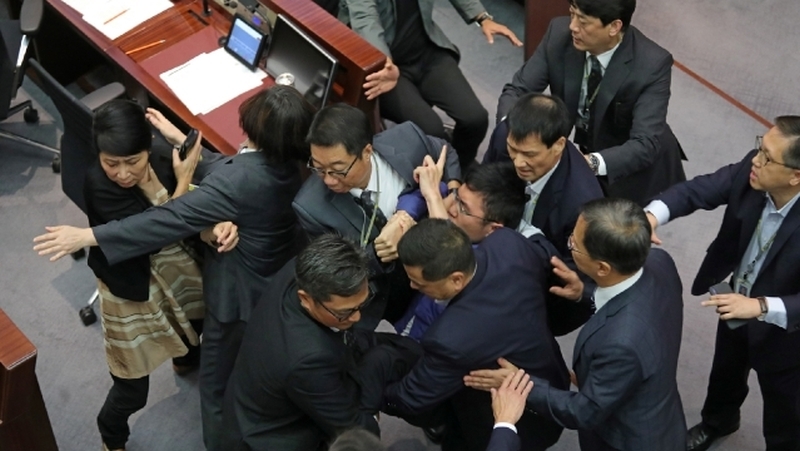 Lawmaker Eddie Chu clapped his hands in a satirical protest: “Good job Chair Ip!” he chanted. Ip ordered him to be removed. They may be able to join the meeting again in the afternoon session. In response, Ip said she was very unhappy about the protests. “They kept shouting, screaming in their seats, or clapping their hands, making a lot of undue noises, obstructing the meeting, and using offensive language towards the chairman. I think they should be held responsible for all the disruption,” she said. She also said the bills committee cannot deal with the issue of constitutionality of the joint checkpoint arrangement, and it may have to be handled by the court after it was passed. The bill will next move to the house committee ahead of the resumption of second reading debate in the main chamber. The West Kowloon terminus is set to begin operating later this year.